What is the Welsh Gravity Enduro Mash Up Series? Since the first UK Gravity Enduro race back in 2011 the sport of “MTB Enduro” has grown exponentially in popularity. The riders doing MTB Enduro have become more and more focussed on training, results. And demands for more technical trails and natural trails has become the norm. The Welsh Gravity Enduro Mash Up Series goes back to the roots of the first Enduro races like the “Kona Mash Up” “Avalanche Enduro” and thus will be using a mix of all weather trails and trail centre trails that can be ridden 365 days of the year. Every run you do will be timed with live timing (subject to network) on stages from 10:00-15:00 (round 3) on race day or 11:30-15:30 (R0und 1 &2). Practice for all competitors on the Mash Up stages will take place from 08:30 – 11:25 then 15:35 – 17:00!! We’ve chosen trails to cater for all riders…some stages will require pedalling others will require skill but all will require a smile. There will also be a Hardtail category and an Ebike category subject to the minimum entry. 1 day racing at your own leisure on 3 or 4 stages ( see individual rounds for more info ) within a 4 hour (rd’s 1 & 2) or 5 hour (rd 3) live timed window, do as many runs as you like in any order you like and ride with whoever you like. Fully marshalled stages with professional timing from Action Sports Timing and medics on site for race day. Prizes; top 3 in each category. Age is based on the age you will be by the 31st Dec 2019. Saturday is race day 3 stages to race as many times as you like from 11:30-15:30! these 3 stages will be closed to all non-Mash Up competitors during live timing 11:25-15:35!! You have the option to race the BNES 5 stage national on the Sunday. Just pay a £20 supplement before 18:30 on Saturday and you’re good to go. You will be given a new number board for Sunday’s race but will keep your transponder. NB: Only those who have entered the Mash up online can race the Mash Up, so if you want to race both days enter the mash up then decide if you want to do the BNES on Sunday, don’t forget to do your practice run of the other 2 stages though! All Trails open to the public all day. No marshals or medics on site, please ride within your limits. All trails are open to the public!! 3 special stages with marked transitions in between. Fastest total time of the 3 special stages wins. Transitions are not timed but the stages are open for 5 hours. Ebike stage, either uphill or a mix of downs and ups within the stage, all ebikes to be Pedalec and restricted to 15.5 mph as per EU Regs. If you have a mechanical or cannot continue, please inform the nearest official as soon as you can. YOU MUST COMPLETE ALL RUNS ONCE YOU HAVE STARTED, THERE ARE NO RE-RUNS. IF YOU HAVE TO PULL OUT OF A RUN YOU CAN DO SO BEFORE YOU PASS MARSHAL POINT 1 ON THE COURSE. AFTER THIS YOU WILL HAVE TO COMPLETE YOUR RUN. JUST GO BACK TO THE START AND GO AGAIN. NO NEED TO INFORM US. Action Sports Timing will be looking after all the timing for the series. A £100 deposit is required for your Timing Transponder, your card details are kept safe, no money is taken! Please return your chip as soon as reasonably possible after you have finished. Welsh Gravity Enduro will be hosting 2 rounds of the newly formed BNES for 2019. The races will be run over 2 days with practice on Saturday over 5 stages BUT you will will have limited time to practice! Practice on stages 3 of the stages used for the Mash Up will be from 08:30 – 11:25 and 15:25 – 17:00 the other 2 stages are open for practice all day from 08:30 – 17:00. 3 of the 5 stages on Saturday will be used for the Mash Up Series form 11:30-15:30. You are more than welcome to race the Mash Up but entries will be limited and only those who have entered the Mash Up online can race the Mash Up. If you have entered the BNES you can only practice on Saturday, Race on Sunday!! Those who have entered the Mash Up only will have the option to race on Sunday as well for a £20 supplement (payable on the day) on top of their £45.50 entry fee. All practice runs are to be continuous! NO STOPPING or SECTIONING! Pushing back up a track will result in an instant DQ! SY5 0SG this postcode will take you past the field. PLEASE MAKE SURE THE SAT NAV BRINGS YOU IN FROM HABBERLEY!!! THERE WILL BE WORKERS ON THE STAGES/TRAILS PREPARING THEM FOR THE EVENT. IF YOU HAVE TO STOP, PLEASE GET OFF THE TRAIL INTO A SAFE PLACE. 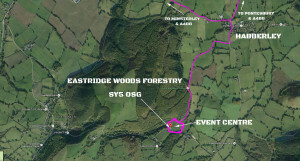 Parking Sunday: In the field, there is limited hard standing car parking on the way in on the right where the Eastridge Woods sign is. If parking in the field please use the top entry to the field and park facing down the hill, if we have bad weather this will allow you all to roll out of the lower exit. Camping: If you wish to camp then you can camp in the field. THERE IS NO WATER ON SITE SO BRING EVERYTHING YOU NEED FOR THE WEEKEND. Practice: Stages 1,2 &3 will be marked for Saturday. You are free to ride them but be aware that they are all open to the public. 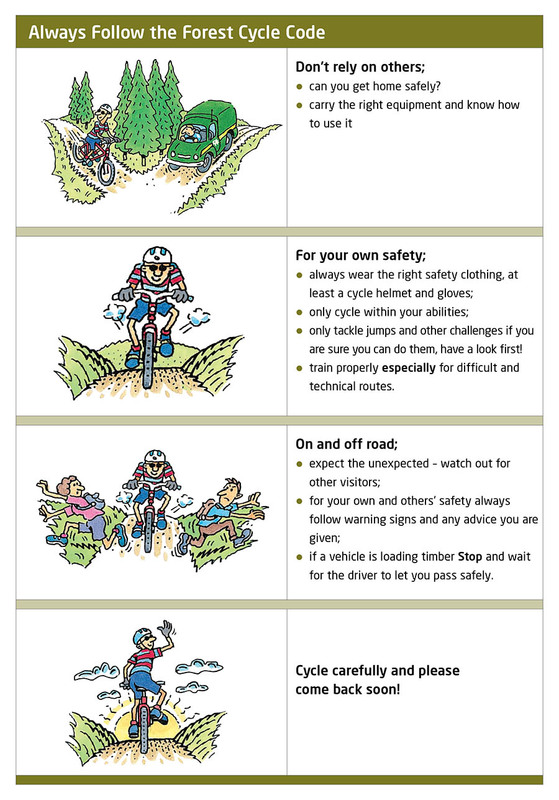 Ride within your limits and respect the Forest code. Sunday: All 3 stages live timed from 10:30-15:30, you are welcome to ride the stages before this time but you must have your number board on and your transponder fixed to your bike when Live timing has begun. Marshals will be on stage from 10:00-15:45. Please bring a deposit of £100 for the timing transponder, either credit/debit card. We do not charge your card it’s just a deposit to make sure all the transponders are handed back in and also so we know you’ve all come back safely. 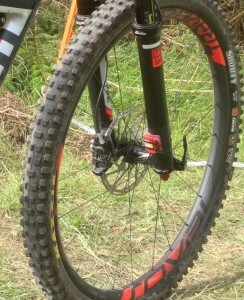 The Timing Chip has to be fitted to the right fork leg as low as possible and facing back wards. You will get a number board for each round this year so you will all get a little memento. Cable ties are provided. Please follow the marked transition all weekend! You can ride them in order which is about 12km for the loop or in any order you like but it rides better as the loop. All stages will be timed from 10:30-15:30 look for the Start boards to signify the start of a timed section and please listen to marshals. YOU MUST ONLY DO COMPLETE RUNS OF ANY STAGE, NO SECTIONING!! The Mash Up format relies on you to self seed yourself at the start of each stage, so ask the guys around you what speed rating they are? eg: If you put down 1 and the rider in front is a 4 then swap places. We recommend leaving a 10-20 second gap before setting off after the rider in front has started. There will be a start line and start clock at every start. Your front Wheel must be ON the start line. The start clock is broken down in to 20 second sections so go on the green! If you do catch someone on stage then shout “Rider” to forewarn them, then as you come closer shout “Rider Left” or “Rider Right” left or right being the side that YOUwill pass them on, please be patient and don’t forget you’ll get another go as long as the stage is open. There will be marshals stationed at various points on stages and at the start and finish of all stages with radios, please follow their instructions. If you are asked to stop do so! If you come across an incident on stage or witness an incident please stop and make sure the rider is safe and that any following riders STOP. Once the situation is safe inform the nearest marshal who will then radio the start marshal and Medics if required. You have a duty of care to your fellow competitors so please keep an eye out for each other. Any problems please do not hesitate to inform the nearest marshal. I (Charlie) will be in radio contact with everyone all day so if you have any questions or you see something’s wrong, then please ask a marshal to contact me and I’ll do my best to sort anything out asap. If you start a stage you must finish that stage no pushing back up! If you have a puncture or mechanical then please leave the track asap and find a safe place to fix it before carrying on and finishing your run. There are numerous points all over the hill where there is 3G reception and right at the finish of stage 4. FOOD: Davey and The Billy Can will be providing food all weekend for you, The Billy Can. Medics: Remote Medical Services will be on site Sunday from 09:00-16:00, they will have a base station in the event arena and a further 4 medics out on the hill on call. How are series points awarded? When do entries close for each event? Entries for each event will close Friday 22:00 2 days before the race, entries will however close earlier if we reach the entry limit of 270. What category should I enter?